A battle was won, but the war continues. And the outstanding fact about the war for Oaxaca is that, even though today it still takes the form and raises demands characteristic of a democratic struggle, underlying it is the class war. It all began with a teachers strike for rather modest demands (above all for rezonification1 for Oaxaca teachers). After June 14, their main demand has been for the expulsion of the murderous governor. In principle, none of this goes beyond the capitalist framework. Nevertheless, the struggle not only faces a despotic cacique (political boss), but the whole semi-bonapartist regime of the Institutional Revolutionary Party (PRI), which ruled Mexico uninterruptedly for 70 years and is still intact in Oaxaca. The many thousands of political operatives who ran the single-party PRI-government in the state are still there, but now deathly afraid of losing their sinecures and facing the ire of an irate populace. In reality, to bring down this regime and defeat its last-ditch defenders will take something approaching a political revolution. Moreover, the struggle takes place in a society characterized by a deep division between a narrow, oligarchic European-derived (criollo) ruling class, and a huge mass of working people largely of Indian origin. With this political and social structure, semicolonial in the strictest sense, “those at the bottom” cannot win without going outside the bourgeois-democratic framework and undertaking a social revolution. Replacing the governor to get another PRI politician, or even a bourgeois “independent,” in his place would not change much, with the possible exception of the level of repression – and maybe not even that. In order for the working people to win their struggle, the popular rebellion must turn into workers revolution. Is there a Oaxaca Commune? Let’s take a look at the key point of reference: the Paris Commune of 1871. Following the defeat of the army of emperor Louis Napoléon in the war against Germany and the proclamation of the Republic in September 1870, the French capital continued to be besieged by the Germans. The plebeian population of Paris distrusted the bourgeois government, which was enjoying the pleasures of a golden refuge in the Versailles Palace. This government, for its part, feared the National Guard because of its proletarian composition. When the regime tried to dissolve the Guard on 18 March 1871, it rebelled and the Parisian workers suddenly found themselves in power. The image of a besieged revolutionary citadel is not totally alien in the present Oaxacan context, particularly today as it approaches a near-insurrectionary situation. At the same time, it is certainly not a very heartening image, presaging a bloody defeat. The Paris Commune was smashed after 72 days, with a toll of more than 30,000 dead and 50,000 jailed among the communards. This is what Iván Rincón Espríu was referring to in warning of the danger of a repetition of the 1968 massacre in the Plaza de Tlatelolco, when the Mexican army massacred perhaps 500 students and leftists. “The troops who will try to smash the Oaxaca Commune and drown the popular discontent in blood and fire (in the process increasing it) have already located their attack points and have taken up their positions,” he wrote in early October. March of the APPO arrives in Mexico City on 9 October. Banner calls for ouster of Oaxaca governor Ulises Ruiz Ortiz. Hernández Navarro’s starting point is also valid: he writes that the movement begun by the Oaxaca teachers strike is the kind of social struggle that presages others of greater magnitude, like the strikes in Cananea (miners) and Río Blanco (textile workers) that were precursors to the Mexican Revolution of 1910-17. His conclusion, however, is to add the Oaxaca rebellion to the struggle against “the cochinero [roughly, swinishness] carried out in the July 2 elections” – i.e., the López Obrador mobilizations under the mantle of the bourgeois PRD. In the case of protests against repression that seek to express enthusiastic support to the heroic Oaxacan fighters, the reference is understandable. But when tendencies which claim to be Marxist and Trotskyist refer to a “Oaxaca Commune,” above all when they do so as praise and glorification, this demonstrates a dangerous theoretical and programmatic light-mindedness: instead of clarifying, it obscure the necessary lessons and measures to win the battle of Oaxaca. It distorts reality by conferring on it a revolutionary content that has yet to be realized, and it reveals that the authors live in a fantasy world. Even worse, in losing confidence in the working class as the vanguard, they look for substitutes: they replace the class struggle with a “democratic,” or rather, “democratizing,” outlook. Instead of the dictatorship of the proletariat, they call for “organs of self-determination of the masses” (LTS, Estrategia Obrera, 21 October). 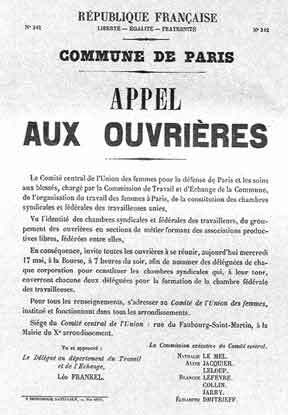 Appeal by the Paris Commune calling for the election of delegates to a federal chamber of women workers. Marx immediately added: “But the working class cannot simply lay hold of the ready-made state machinery, and wield it for its own purposes.” The proletariat had to build its own government, in which “the majority of its members were naturally workers, or acknowledged representatives of the working class. The Commune was to be a working, not a parliamentary body, executive and legislative at the same time.” This was the main amendment Marx and Engels made to the Communist Manifesto since it was written in 1848. So let’s take a look at the Oaxacan situation today. The leading body of the struggle, the Popular Assembly of the Peoples of Oaxaca, does not define itself as a government, nor is it one in fact. It is an organ of struggle, whose leadership consists of representatives of different organizations. Until now, the large majority of the delegates have not been elected but rather were named by the leaderships of the groups which make up the APPO. Its backbone is Section 22 of the SNTE-CNTE (the teachers union), and it includes various unions of public employees (workers of the secretariat of health, the Social Security Institute, the ISSTE, the University of Oaxaca, airports) belonging to the FSODO (Front of Unions and Democratic Organizations of Oaxaca), as well as telephone workers and bus drivers, along with semi-labor groups (Associated Women Trade Unionists, retired railroad workers) and leftist organizations (Frente Popular Revolucionario, Comité de Defensa de los Derechos del Pueblo [Committee for Defense of the Rights of the People], Partido Obrero Socialista [Socialist Workers Party, now rebaptized the Movement for Socialism]). 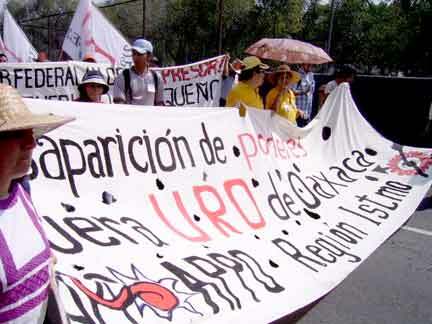 But it also includes a number of organizations of indigenous peoples – the Organization of Indigenous Zapotec Peoples (OPIZ), the Popular Indigenous Council of Oaxaca (CIPO), the Union of Indigenous Communities of the Northern Isthmus (UCIZONI), Movement of United Triqui Struggle (MULT) – and peasant organizations. There is no doubt that the APPO has struck root in the Oaxacan masses by having resisted for so long the siege by state and federal governments and the murderous violence of the thugs and paramilitaries. But it is not a nascent workers government. The APPO has a multi-class character, with a petty-bourgeois leadership in which popular-front politics predominate. The decisions of the National Forum on Constructing Democracy and Governability called by the APPO last August 16 and 17, for example, called to “generate alliances with different sectors and political actors premised on our main demand: for the ouster of Ulises Ruiz Ortiz.” At the same time, it urged “the installation of a Popular Government Council” and the formation of a “Great National Popular Assembly.” For many in the APPO, these calls are directed at the PRD, whose representatives have had discussions with the APPO in Oaxaca in recent days. Spokesman of the Grupo Internacionalista speaks to forum called by APPO in mid-August. PRD supporters tried to shout him down. To be sure, the APPO and Section 22 have had to carry out certain governmental functions, constituting the Honorable Body of Topiles (a kind of popular police, derived from indigenous community organizations) and the Oaxaca Teachers Police (POMO) to maintain order in the occupied city, detaining thieves and in some cases submitting them to popular trials. But these are only episodic organs and measures of struggle of the sort that would arise in any general strike that lasted for a time. It is also true that there are aspects of dual power with the occupation of the capital by the APPO and the installation of popular municipal councils in around 20 municipalities. But this is not dual power of different classes. The APPO has not made any moves against private property whatsoever: it has not taken over hotels, or haciendas, factories or transportation companies. Nor has it seized federal government institutions, like the highways or airport. Above all, with its call for “peaceful” resistance against the onslaught by the forces of Ulises Ruiz and the federal government, it has not called into question the bourgeois state’s monopoly of armed force. In fact, in negotiations with the interior ministry (Gobernación) APPO leaders accepted in principle the incursion of the Federal Preventive Police into Oaxaca. 1Section 22 of the SNTE-CNTE, demanded that Oaxaca teachers’ pay be increased from Zone 3 to Zone 2, citing the high cost of living in this state which is a prime tourist destination. 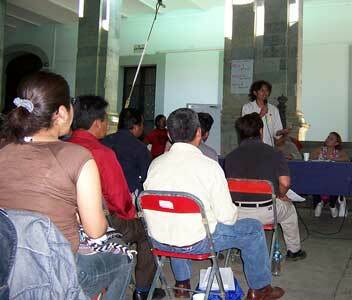 At present, Oaxacan teachers, whose average salary is about US$525 a month, earn less than teachers in Chiapas.